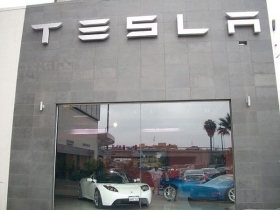 By selling Zero Emission Vehicle credits earned from the sale of its Roadster in California, Tesla Motors earned $12 million. Large automakers must hit ZEV sales and production targets, but buying credits can give them some flexibility. "There will definitely be more models after the S and X. Maybe an E :)," Musk wrote. Reuters reported on Tesla's Model E application on Wednesday.